Published June, 2017. Black Rose Writing, Texas, USA. Second place overall in the 2018 Pencraft Awards. Honorable Mention, 2017 San Francisco Book Festival. Voted Number One in the 2017 Onlinebookclub historical fiction book of the year voting. NOW IN BOOKSTORES AND WITH ONLINE BOOKSELLERS EVERYWHERE IS PERHAPS THE LAST GREAT WORLD WAR II STORY OF A STILL-LIVING PARATROOPER! LEFT FOR DEAD AT NIJMEGEN, THE TRUE STORY OF AN AMERICAN PARATROOPER IN WORLD WAR II. FOR A TWENTY PERCENT DISCOUNT AND FREE SHIPPING ON PRE-ORDERS GO TO HUDSON BOOKSELLERS and HURRY BEFORE THE OFFER EXPIRES! Nannini chronicle of events and the description of, Masaharu Yokoyama’s life gives evidence of a deeply and broadly researched effort in the writing of his book. Nannini gives us both the daily textures of Yokoyama’s life and the arcing currents of his time, not only is it a story about his participation in the Pearl Harbor attack, but also about the culture from which that day of infamy sprung. Nannini recreates a minute by minute account of Masaharu Yokoyama’s involvement in the Pearl Harbor attack. Written from the perspective of an enemy soldier the book sheds a new light on an event that ushered in a war that would take over 400 thousand American lives. PUBLISHER’S WEEKLY REVIEW OF OCTOBER 2, 2017. I’m very pleased to announce that the September 2017 issue of our online book review magazine “Small Press Bookwatch” features a review of “Chameleons: An Untold World War II Story”. 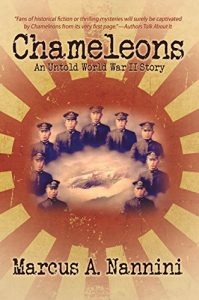 Critique: An original and inherently engaging novel from beginning to end, “Chameleons: An Untold World War II Story” is a truly extraordinary and deftly written entertainment that reveals author Marcus A. Nannini’s genuine flair for taken an actual historical incident and crafting it into a detailed and compelling narrative. While very highly recommended, especially for community library General Fiction collections, it should be noted for the personal reading lists that “Chameleons: An Untold World War II Story” is also readily available in a digital book format (Kindle, $6.99). We are pleased to announce that our judges of the 2018 PenCraft Award for literary excellence voted your book “Chameleons: An Untold World War II Story” published by Black Rose Writing as our Fiction – Historical 2nd Place Winner. Your book was nominated by AuthorsReading.com for consideration in the 2018 competition. We want our PenCraft Awards to represent true book winners, and your book was truly one of them. Books that win our competition are not only examples of literary excellence but have also demonstrated a popularity with readers. Many of the winner authors have toured with their book, received national recognition, and even had their work featured on A&E. To select our finalists, the numerous PenCraft Award submissions were culled down by using a judging criterion that incorporated a recommendation from the initial AuthorsReader’s reviewer or PenCraft Award reviewer and then further evaluation by our judges. Another criteria considered for the 2018 PenCraft Award Competition was the popularity of the submitted book in the marketplace and the effort the publisher or author appeared to be taking in promoting their book. From this process, we determined the winners of each category. Tere Fredericks: On Goodreads and Amazon, I gave you 5 stars. This was/is an amazing book. Please get off Facebook, stop eating, and stop doing anything else and get your next two books done, ok? I simply loved this book. Loved it. By Amazon customer, Nannette Fitz A fast read with surprises! Enjoyed the story and the way it took us back and forth between the different characters. I recommend it for those who love to read and try different genres. Five out of five stars. Great book! By psyche, on March 7, 2017 From the beginning scene in 1941, inside a hot, cramped midget sub, I was hooked. When the first chapter ended and I began chapter two I found myself standing on a beach in present day Hawaii. Wow! The contrast pulled me in further. There was suddenly a mystery as some workers digging a pool found a skeleton with a handgun, a mysterious box and a sword. Then I had to keep reading. By the time I got to the middle of the book I began viewing the antagonist as more of a protagonist. At 3/4 way through he was the protagonist and the Navy had become the enemy. While the newspaper reporter became vile, I very much appreciated that the author gave some underlying reasons for her behavior. The last ninety pages were a whirlwind. I could not stop reading until the end. Very unique story. I felt as if I were in each scene with the people and locations so realistically described. I highly recommend this book! Five out of five stars. Get this Book! By an Amazon customer on March 7, 2017 I LOVED this book! I don’t normally read history novels but I have read other short stories by this author and really liked his writing so I bought it. What a fantastic way to learn about both US and Japanese history while being engaged in a suspenseful novel. The author beautifully develops the characters and shows the humanity of both sides. Now my 13 year old son is totally hooked…highly recommend! Five out of five stars. Fast Read! By an Amazon customer on January 19, 2017 Unpredictable with a great deal of action, twists, turns and surprises. At the depths of Pearl Harbor, on the morning of December 7th, 1941, Imperial Japanese Naval Lieutenant Masaharu Yokoyama and his engineer Sadamu Kamita await with bated breath aboard their midget submarine. In present day Kailua, Oahu, a skeleton is dug up in Auntie Lee’s backyard, launching not only a full blown naval investigation, but also a race against the clock to beat the media to the punch. Thus begins Chameleons by Marcus A. Nannini, a breathtaking historical fiction novel that has one foot planted firmly in the actions surrounding the attack on Pearl Harbor and the other around a present day investigation that could shed new light on those very events. 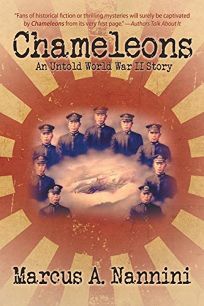 One stream in the novel follows Lt. Yokoyama, an elite Japanese naval officer hand-picked to be one of the Japanese empire’s secret midget submarine commanders who will attack the United States in 1941. Upon successfully delivering a crippling blow to the USS Oklahoma, he and his engineer are unable to make it back to their rendezvous point on the submarine from which they launched. They must put into action their contingency plan: slip ashore, meet up with Japanese/American sympathisers, and blend in with the surrounding population as would a chameleon. Lt. Yokoyama is given a new identity, a new job on the island, and a new family history. When the Japanese are gathered up and placed in internment camps, he is sure that he will have the power to motivate his fellow internees to rebel against the American guards and eventually make it back to his Emperor’s navy. However, Lt. Yokoyama quickly realises that there may not be as much animosity towards their incarcerators as he would hope. In fact, he soon finds himself at a crossroads that will challenge the balance between his previous loyalties and his adopted persona. The thing I enjoyed the most about this book is how the concept of loyalty is addressed. In Lt. Yokoyama’s timeline, he has some tough decisions to make on where his loyalties lie. He needs to determine how to live his life during and after his time in the Japanese internment camps. In the modern timeline, the naval investigation team needs to decide whether their loyalty lies in doing the right thing or doing their job regardless of the consequences. The only part of this book that I had issues with was the ending. There was a lot of build up toward the end of the book and I feel that some of the major conflicts which persisted throughout the novel were resolved a bit too quickly. To be clear, I liked how it ended, but I feel that it could have contained a bit more detail and depth for it to be realistic. As well, I felt that in the last couple of chapters Mr. Nannini was introducing new and irrelevant information to the story (new characters, conflict, etc.) I realise now that this is likely as a build up for future books with the same characters, but I found myself wondering how this fit into our current storyline. I thoroughly enjoyed Chameleons by Marcus A. Nannini and therefore have no problem giving it 4 out of 4 stars. Apr 19, 2017 Tere Fredericks rated it: FIVE OF FIVE STARS! : historical, read-again, highly-recommended, action, adventure, favorites, war-stories. Although I am female, I am fascinated by the events at Pearl Harbor. When I saw this book was available at Kindle Unlimited, I grabbed it. I will look for more of Mr. Nannini’s books, believe me! A body is found on a beach on Oahu, Hawai’i. Contained within the grave is a box and a gun used by the United States army prior to 1940. Unbeknownst to those who investigated this finding, a sword was also found, but taken by the owner of the property where the grave was located. The admiral of the naval Although I am female, I am fascinated by the events at Pearl Harbor. When I saw this book was available at Kindle Unlimited, I grabbed it. I will look for more of Mr. Nannini’s books, believe me! A body is found on a beach on Oahu, Hawai’i. Contained within the grave is a box and a gun used by the United States army prior to 1940. Unbeknownst to those who investigated this finding, a sword was also found, but taken by the owner of the property where the grave was located. The admiral of the naval base near where the body is located believes the body belongs to a Japanese naval officer from a minisub, responsible for the real reason the U.S.S. Oklahoma “turned turtle.” Once the box found with the body is opened, a logbook is found inside. A naval officer who is already involved in the investigation translates the book. As a side story, an old man whose name is Ken, starts telling his grandson about his “first life.” This is extremely fascinating as it may explain how World War II was looked at from the Japanese point of view, but also how minisubs came to be part of the Japanese navy’s arsenal. As an aside, during parts of the story, although where the Americans got their beer, it was interesting that the Japanese just found their sake. Just an observation. As the navy tries to quietly discover whose bones have been found, they are betrayed. A local newspaper offers a huge reward for the same information the navy is trying to uncover. The detail of the atmosphere inside a Japanese minsub during the war is fascinating. Reading about the Nisei who joined the United States Army from their forced “protection” from a Japanese point of view is incredible. Most joined to fight the Germans, this is how they were recruited. However, it was not always the Germans they fought against. Descriptive sentences and paragraphs used completely thorough out the book made up for some typographical errors. Those were slight enough to be read through, although I did note some. I’m sure there will be many in this review. This book, from a Japanese viewpoint, from Hawai’i to Korea and back to Hawai’i, was riveting. Some of the war scenes were enough to keep my fingers gripping my seat, literally. You will not see the ending coming, it is a total surprise. In a nutshell, if you like historical war fiction, this is definitely for you. The fact that it is definitely based on true events is proven by the pictures in the back of the book. There is enough here to make you wonder what exactly is fiction and what is not.